This page is about the tank destroyer M18 GMC. For the premium version, see M18 "Black Cat". For the upgunned "super" version, see Super Hellcat. The M18 Gun Motor Carriage, also known as the M18 GMC, is a Rank III American tank destroyer with a battle rating of 4.7 (AB/SB) and 5.3 (RB). It was introduced in Update 1.49 "Weapons of Victory". The M18 "Hellcat" was the epitome of the American tank destroyer doctrine, it was very fast, very mobile, and has a powerful gun, though with a large trade-off with only 12.7 mm (0.5 inches) of armour. 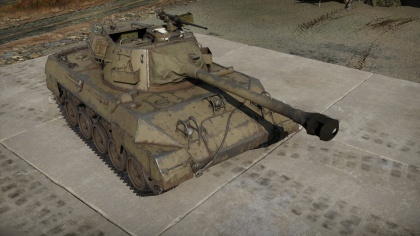 The M18 "Hellcat" compensates the lack of anti-tank capability on U.S vehicles by having access to a 76 mm gun with APCR ammunition, all in the battle rating of 4.7. This makes the M18 able to fight off many of the high-ranking vehicles it could face like the Panther D, Tiger H1, KV-1, KV-85, and IS-1. 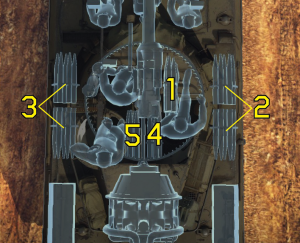 Unlike the other tank destroyers known in the game, the M18 "Hellcat" has access to a 360° traversable turret, allowing players to have a greater arc of fire than a typical casemate tank destroyer like the StuG III, but at the expense of a slightly higher profile. Americans tank destroyers also have very high maneuverability compared to other nation's tank destroyers, allowing it to flank the enemy. Relocate: This movement will have to be done again and again. Choose a good spot wisely, remove the foliage if necessary to get a clear field of fire. When in the fire spot, use the gun depression and stay in a hull down position until a target is located. Once a target is locked on, aim at critical components. Try to immobilize the enemy by firing at the engine or transmission, or remove their firepower by shooting the gun or breech, or for an instant destruction with a shot to the ammo storage. The last option can work very well or not, as skilled players only carry a few rounds of ammo. Avoid flat terrain: Flat terrain means that the Hellcat will become an easy target for virtually any vehicle by exposure, especially when not moving or when moving in a straight line. Open plains are the bane of the Hellcat. Whenever possible, one should try to stay amongst hills. The nature of its thin armour means AP rounds have a tendency to pass straight through without damaging modules, and an APHE fuze may not even be triggered. A moment of immobility due to a damaged engine or transmission could be a sign of impending doom for the M18. The anti-tank doctrine established by the US military called for fast, powerful vehicles able to stop the German blitzkrieg tactics by ambushing the attacking tank forces. This doctrine, known as the "Tank Destroyer Doctrine", called for anti-tank forces to be held in the reserves anticipating for the massed tank attack that the Germans have been using to run over France. However, the issue with this is that the front-line forces would be left vulnerable without any anti-tank weaponry at hand. The solution was to keep a few anti-tank guns in the front-line as the first defense, while a large reserve of mobile tank destroyers would move in at the location where a German tank breakthrough is happening to ambush and destroy the enemy force. This role led to the desire for a fast vehicle with a powerful gun, armour was not a concern due to the emphasis in speed. The initial response was the M10 GMC, made form the M4 Sherman hull and mounting a 3-inch M1918 gun. While adequate at this role, it was no faster than an ordinary Sherman tank. The M18 Gun Motor Carriage was a response to the problem to provide the tank destroyer force with a very fast tank destroyer. The origin of the M18 design came as early as December 1941 with the requirement of a Christie suspension and a 37 mm gun. This requirement called for a radical new tank design rather than a derivative of the M4 Sherman. These requirements changed as the war progressed, the first change was to the new and innovative Torsion bar suspension from Buick Motor Division from General Motors and another change was to mount the British QF 6-pounder gun then in use on their Churchill Mark III tanks, the developed prototype vehicle was called the T49 GMC. Then the US Army wanted the heavier 75 mm gun used on the Shermans on it, this prototype was designated the T67 GMC. 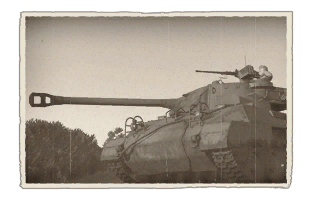 Finally, the army decided to mount the 76 mm gun also in development for the Sherman onto the prototype, now known as T70 GMC. Changes to hull shape and turret took place to accommodate all these new requirements and armament, but it eventually was approved for service and finally renamed as the M18 GMC and started production in mid-1943, which went on until ending in October 1944 with 2,507 units produced. A variant called the M39 Armored Utility Vehicle was also produced, its turret was removed for space for cargo, 8 personnel, or to tow guns. These vehicles saw combat debut in the summer of 1944, where they are given the unofficial nickname "Hellcat" by the crews using them. Unlike the M10 tank destroyer that was built before it, the M18 GMC was purely made for emphasis on speed. Armour was restricted down to a maximum of 1-inch (25 mm) on the turret front while the rest of the body plating are a measly .50-inches thick (12.7 mm). The turret was also an open-top design similar to the M10 tank destroyer, meaning the crew are left exposed to the elements and enemy fire and shrapnel. These faults were mitigated by the fact that as its role as an tank destroyer, it was to have minimum contact with infantry and ambush enemy tanks in concealed position rather than face them in an offensive operation. Nevertheless, the M18 GMC were well liked by the crew for its 76 mm cannon, which allows it to destroy the newer German Tiger Is and Panthers tanks from the front with HVAP ammo (though the Panther at close range only) when unable to flank around to the side or rear of these tanks. The speed was also astounding, reaching 55 miles per hour maximum, this makes the M18 GMC the fastest armoured fighting vehicle in World War II. Skins and camouflages for the M18 Hellcat series from live.warthunder.com. This page was last edited on 26 March 2019, at 05:53.